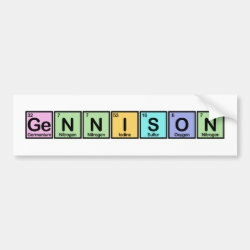 Here is the unique name Gennison spelled out using elements from the periodic table. The elements are lined up inside colorful boxes which makes this a More... fun design for anyone named Gennison! Fine for fans of chemistry, academics, and science teachers. Note that this name is offered here in two different styles: one with seven squares and one with six.